The holidays are the perfect time to whip out the scissors and glue and kick off the new year right by creating a financial vision board -- a poster or bulletin board you fill with images and words that illustrate your ideal life. 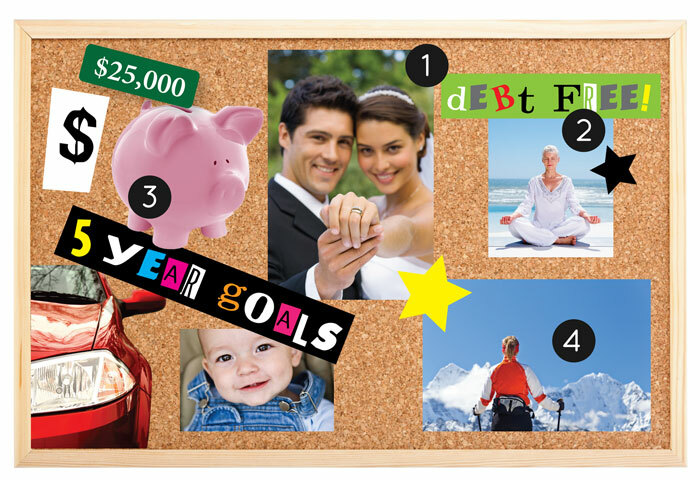 Read more about financial vision boards at LearnVest.com. What if there were a fun, free, creative project that could help you reach your financial goals faster? Well, there is. And the holidays — when there’s no shortage of catalogs lying around — are the perfect time to whip out the scissors and glue, and kick off the new year right by creating a financial vision board. What is a vision board? Basically, it’s a poster or bulletin board you fill with images and words that illustrate your ideal life. You can tear photos from magazines, put up cards or print Google images, or draw whatever it is you need. The goal is to choose five to ten goals you want to focus on. Maybe your board will include a new job and a perfect house, a dream wedding and a healthy baby, or you, smiling because you’ve finally gotten out of debt or saved up an emergency fund. Then again, maybe it will be filled with all of the above. The benefits of this exercise are twofold: Not only can mapping out your priorities help you determine where your money should go, tapping into your deepest desires can set you on a path to achieving what may seem out of reach today. After all, just the simple act of writing down your goals helps you focus your energy on making them a reality. –Catalogs and magazines. The more variety, the better. We’ve been conditioned to want the things we see around us. Designer clothes, a bigger house, a shinier car. Those things are all well and good, but now is the time to think about what would truly make you happy, even if it’s not the tried and true. Before you begin combing through magazines, takes some time to daydream and picture yourself living the life you want. Remember, you needn’t choose “things” only: A financial vision board should reflect your ideal reality, whether that’s a strong marriage, a mortgage paid off, or, okay, a new car. Start flipping through your stack of magazines and indiscriminately tear out anything that speaks to you. Words, phrases, images—whatever catches your eye. You’ll sort through them later, but for now, anything goes. Maybe you’ll spy your perfect rustic cottage in an Anthropologie catalog, or tear out a woman enjoying an idyllic yoga retreat during her comfortable retirement. Once you’ve got a sizeable collection of images and words, it’s time to edit down to the five to ten goals that are most important to you. Start by arranging the scraps of paper on your board, but don’t use glue yet. Think of this as putting the pieces of the puzzle together. How does it all fit? You might get rid of a few images as you go, and that’s okay. Keep the placement of items free form if you want, or organize them by timeframes (1-year goals, 5-year goals., etc. ), or by theme (health, finances, fun). The next step is to cement your visions by gluing them down. Use this time to mentally commit to the goals you’ve chosen. If climbing Mount Everest is something you really, really want to do, then start telling yourself you will. It may feel weird at first, but this is the first step toward making your dreams a reality. The most powerful part of creating a vision board is identifying your goals, both big and small, but keeping them front of mind is helpful, too. If you can, hang the board somewhere you’ll see it every day. Or consider taking a photo of your board and making it your background on your laptop or smart phone. Now it’s time to make your finances reflect your goals. To start, you might choose one goal to focus on this year. Then find creative ways to fit it into your budget: Maybe you make a jar labeled with one of your goals and drop all of your loose change in it, or decide not to spend $5 bills, but save them here instead. One easy way is to create a folder for your dream in the LearnVest My Money Center. Even if you only allocate $10 from each paycheck, the important part is that you’ve created the goal, and you’ll be directing energy toward it on a regular basis. If there’s one thing we’ve learned, it’s that nothing big happens without first dreaming the dream. And that’s especially true when it comes to money. Before rolling up your sleeves this year, make sure you’ve set your sights right. It’s the line between warmth and luxury: the Haimish Line. Putting fancy shoes on your vision board? If you’re going to splurge, here’s how to splurge right. Don’t overstress yourself with financial to-dos! Check out these 13 signs you’re too busy.